Leading Immunostimulants Medicinal Bracelets: The Missing Link in Antioxidant Therapy? Halotherapy (HT, from Greek halos=salt) uses dry aerosol microparticles of salt and, in one version, minerals to treat respiratory diseases. HT seeks to replicate the conditions of speleotherapy (from Greek speleos=cave), a treatment that has been practiced in old salt mines of Eastern Europe since the early 19th Century. Halotherapy belongs to the category of the physical therapies–non-drug treatments of diseases, many associated with the spa treatments of Eastern Europe. In the former Soviet Union, medical researchers engaged in a concerted effort to develop physical therapies in order to avoid the costs and side effects of drug therapy as well as microbial and tumor resistance. Russia has become the world leader in developing and testing new and increasingly effective physical therapies. Most of the dozens of clinical trials thus far, mainly reported in Russian-language journals, have focussed on HT as a treatment of asthma and chronic bronchitis. But HT may also be effective as a main or adjuvant therapy across the entire range of upper and lower respiratory tract diseases and potentially against systemic diseases as well. Respiratory diseases are a major cause of morbidity and mortality worldwide. Asthma has become ever more prevalent in industrialized societies, with special impact on children. Meanwhile, cigarette smoking has spread chronic bronchitis and emphysema everywhere; in developing countries biomass cooking smoke has a similar devastating impact on women and children. The situation in especially bad in China, with its 350 million smokers and terrible air pollution. Most drug therapies of respiratory diseases have only palliative effects, and many have significant side effects. So a physical therapy like HT is much needed. HT’s excellent action and modest cost make it a very attractive kind of medicine. It is likely that miners and others knew about the beneficial health effects of the microclimate of salt mines for centuries before they were first described in a book published by a Polish physician in 1843. Since then, the practice of bringing patients with respiratory diseases down into salt mines for cures gradually spread throughout Eastern Europe, and it has become a standard feature of spa treatment there. By its very nature, speleotherapy resists scientific norms. The reported healing and invigorating effects of the microclimate of salt mines are variously ascribed to the microparticles of salt floating in the air, the temperature, the relative humidity, the near or total absence of pathogens and allergens, the effects of radiation from minerals, and the tranquillity of the setting. But it is difficult to determine the relative influence of these factors, and presumably some synergy exists. In addition, each chamber in each mine has a distinct microclimate. Conducting clinical trials in such conditions is not easy. Often speleotherapy has been combined with other modalities. And many of the early clinical trial reports lacked scientific rigor. Speleotherapy also makes a great demand on patients’ time. The mines are not conveniently located for most people. The total cost is fairly significant. Determining a specific dose and tracking long-term effects of speleotherapy have proven very elusive goals. Nonetheless, various clinical trial reports and the favorable outcomes for many individual patients have led to growing scientific attention and a devoted following for speleotherapy (for a sample report, see Horvath, 1986). They also gave the Soviet (now Russian) space agency the idea of developing microclimate optimization devices for cosmonauts that would replicate the microclimates of salt mines. Most of this work has been done in St. Petersburg, which is now the location of the leading Russian HT company, Aeromed Ltd, and of the Arsenal Design Bureau, which works on the salt + mineral approach. In the 1980s the Russians began to build halochambers that recreated in clinics the microclimate of salt mines. These halochambers have floors and walls lined with rock salt (halite). Patients sit in the halochamber for an hour per session while music and pleasant videos are played to create a relaxed mood. Halochambers are certified as medical devices in Russia, are in use in Eastern Europe, and are starting to spread to North America. Another approach has been the desktop HT device, which has tubes for breathing in the aerosol salt or simply fills the air with microparticles of salt. Thus far no multimineral aerosol appears to have been supplied this way, though halochambers have been lined with silvinite, the rock from potash mines that contains about 60 percent sodium chloride, 35 percent potassium chloride, and 5 percent of other minerals. Pure halite is the precipitate from the shores of ancient seas, while silvinite results from the evaporation of a dead sea. Often a desktop HT device is used in combination with a halochamber. A ceramic salt pipe from Hungary represents a third approach. The patient breathes in gently through the mouth, then exhales through the nose. A fourth, popular device is the rock crystal lamp (Pakistan) or salt lamp (Poland), which is comprised of a largish piece of rock salt with an attached light bulb that glows through the salt and whose heat causes microparticles to become airborne. Serious clinical studies have been done of the first two methods, where the number of microparticles per cubic meter is monitored, permitting accurate dose measurement. The ability to deliver a specified dose represents a major advantage of halotherapy over speleotherapy. Still, speleotherapy retains importance as a source of scientific evidence regarding the as-yet not well-characterized, multiple factors that deliver the therapeutic effect. 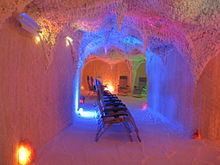 Depending on the conditions of a certain salt mine or cave, speleotherapy might also prove more effective than halotherapy in a given case. Aerosolized microparticles larger than 10 microns in diameter are caught in the upper airways and transported up and out of the respiratory tract by the mucociliary system. In the range of 5-10 microns, they penetrate into the trachea and central bronchial area, but no farther. Only below 5 microns do the microparticles penetrate deep into the lungs, though the larger microparticles have useful effects in the upper respiratory tract. In the range of 0.1-2.5 microns–the same size as the most damaging microparticles from auto and industrial pollution, and invisible to the human eye–the microparticles of salt penetrate into every corner of the bronchi, bronchioles, and alveoli and deposit upon the surface. Even though the salt microparticles spread over an area in the alveoli roughly the size of a tennis court, only a few milligrams of salt are needed. So there need be no concern about the possibility of excessive salt intake from halotherapy in the case of hypertensive patients. The extremely small size, relatively low amount, and slow dosing of the microparticles also make them much less likely to provoke a hyperreactive response in asthma patients than moist hypertonic saline. The hygroscopic characteristics of moist particles make them grow significantly during transit and therefore to deposit mainly in the upper respiratory tract and in the central area of the trachea and bronchi. Still, studies have shown that moist particles of salt from hypertonic saline have beneficial effects in cystic fibrosis, for instance, at least in the short term (Wark and McDonald, 2004). A significant parameter for HT devices, therefore, is the fraction of the microparticles produced that is below 2.5 microns. According to many authors, maintaining a room temperature in the vicinity of 18-24° C and a relative humidity around 50% can conduce to better treatment outcomes. Devices can be set to emit different amounts of salt microparticles-e.g., four levels from 1 to 16 mg/m³, monitored by a microparticle counting device. Another parameter of note is the negative electrical charge on the particles, which has been measured at 6-10 nK/m³ (Chervinskaya, 2002). For further information, see the chapter on Halotherapy and other chapters on respiratory therapies in Intriguing Anomalies: An Introduction to Scientific Detective Work). See also Treating Respiratory Disorders without Drugs. Wark, P.A.B. and V. McDonald (2004), “Nebulised Hypertonic Saline for Cystic Fibrosis,” Cochrane Review (abstract), www.update-software.com/abstracts/AB001506.htm (as of August 3, 2004).